So you can’t have enough of your iPad. You use it to browse the net, watch your favorite video, read the news (or a book), check the weather, tweet your opinions, find your way and slingshot Angry Birds. You’re basically inseparable. With HyperOffice you can store and organize your business documents online, together with permissions, version control, comments and more. Now you can use your iPad to access these documents. You can also use free third party WebDav tools to edit and work together on these documents with colleagues. HyperOffice is a corporate email service where you can set up dedicated email for your business – employees@yourcompany.com. You have two ways in which you can access this email on your iPad. 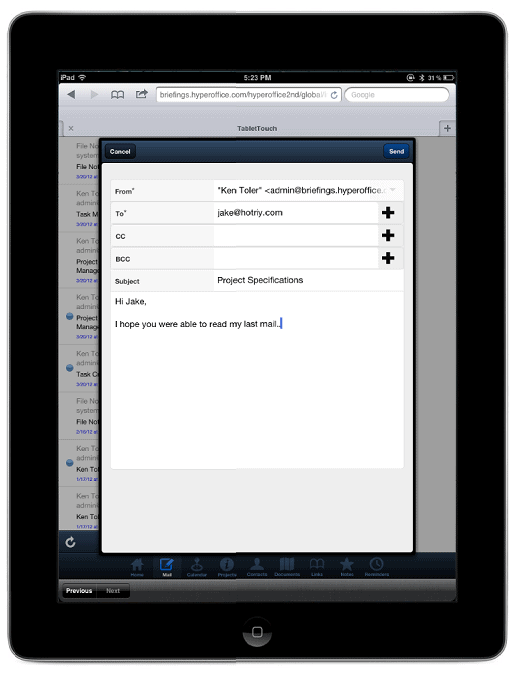 – Use the HyperOffice web app to access email through an interface specially designed for your iPad. – Push corporate email to your native iPad email app. So as soon as an email arrives in your corporate inbox, it is instantly pushed down to your iPad email app. 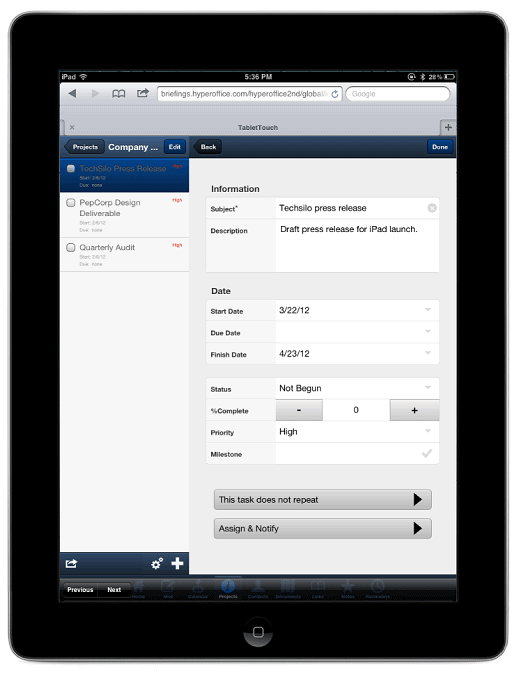 HyperOffice’s web app allows you to use your iPad as a project management tool. You can manage all aspects of a team project – create projects, add tasks and activities, set dependencies, assign responsibilities, set timelines and priorities, attach resources – from a single interface. 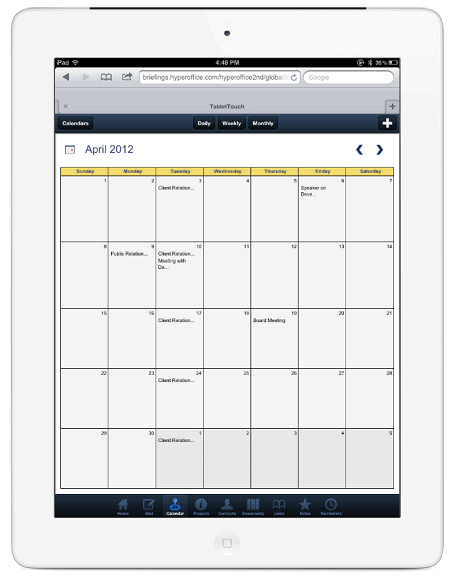 You can also create group calendars that everyone on your team can see on their iPad. This ensures that everyone is on top of group schedules. You can also set up meetings and send out invites directly from the calendar console. You can even sync with your native iPad calendar and share events that you set up on your iPad calendar. So if you create an event on your iPad calendar, it with instantly show up on your teams’ iPad calendar as well – isn’t that cool? Like calendars, you can access and manage your corporate contacts, all categorized in groups and lists (HR, Marketing, important clients, partners – anything you like) right on your iPad. Your other team members have access to these contacts as well (provided they have the rights). Also, like calendars, you can sync these contacts with your native iPad address book, and share contacts with teammates. So, what are you waiting for? Go extract productivity from your iPad! 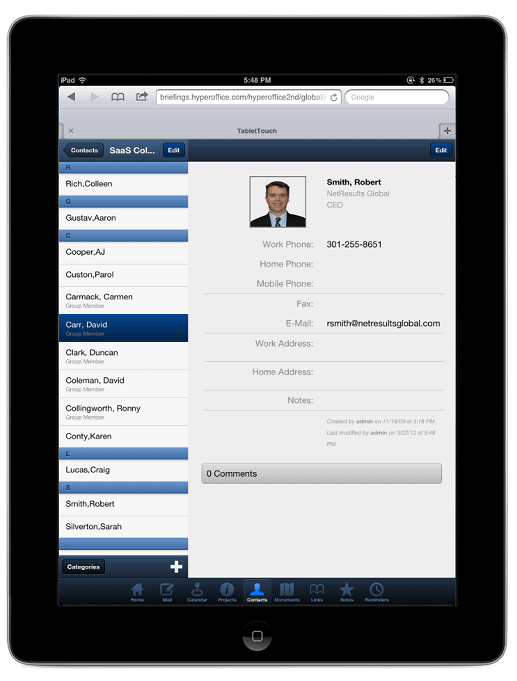 Find more information about the HyperOffice iPad app here. Previous Post Previous post:Guess what’s coming soon…? Be Social (and productive) at work! Next Post Should your business take the Google Drive?